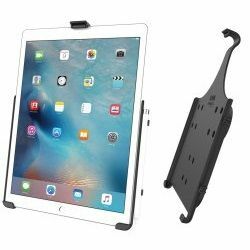 The RAM® Mounts EZ-Roll’r™ for the iPad Pro secures your device in a form-fit holder that keeps the entire screen visible. Designed for tablets that are not in a case, the EZ-Roll’r for the iPad Pro features a holder for the Apple Pencil as well. Simply slide the tablet into the bottom cups and then roll the top clip over the top of the device to anchor it. Side buttons, charging port and camera lens are conveniently exposed and accessible while in the EZ-Roll'r™ holder. Included is a set of four nuts and bolts to connect to any suitable RAM components, or mounts that contain the universal AMPs hole pattern.